How do I know if I should hire movers, and how should I prepare for the move? Do-it-yourself moving is fine for some people; however, it is not realistic for many people who have a houseful of belongings, limited time, and limited packing skills, so hiring a moving company in Bucks County is important. In addition, the risk of getting hurt from lifting and carrying heavy boxes is not worth it for them. 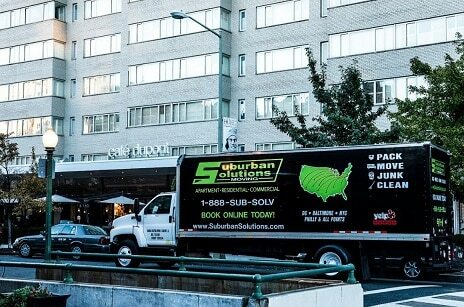 If you would like to talk with a specialist from Suburban Solutions about our comprehensive moving services, call us. Do you have heavy items? Would you like help with packing, loading, and unloading, or just certain of these tasks? Do have you fragile or awkward shaped items that need to be specially boxed? Do you need to move cars, boats, or other vehicles? Do you lack the time needed to pack and move your belongings? Are you moving across or out of state? Once you have decided that you need a moving company in Bucks County, call Suburban Solutions to explain your needs and receive a complimentary quote. Keep in mind that April through July is a busy time of the year for people moving. If you’re moving around this time, you should reserve your booking as far in advance as possible. If you have packed your belongings, you may want to place notes, tags, or stickers on any items/boxes that the moving company in Bucks County should load. It’s helpful to list the box’s contents and to which room it should be taken. Defrost your freezer and refrigerator if you will be moving them. Drain the washing machine if you will be moving it. Remove flammable materials/liquids from lawn equipment, machinery, grills, etc. Turn off the gas line if you use gas and will move any gas appliances. Unplug any appliances that you will be moving. Make a safe and wide path through your home and garage. This should be large enough that furniture can be moved through with ease. Make sure there is nothing in the way that could cause a slip and fall accident or poke someone. Confirm that your housing association allows moving trucks to park in the area that you have designated. Also make sure there is room for the truck and that they will not block any driveways, roads, fire hydrants, and so forth. If children or pets will be on site, find a comfortable, safe place for them to occupy their time. For safety reasons, this should be away from the movers. If you have any special instructions for the moving company in Bucks County, make an effort to let them know beforehand. Leaving a home, saying goodbye to friends, and interrupting a little one’s routine might seem a bit overwhelming. Regardless of their age, moving with children is not always easy. Luckily there are different ways to minimize the stress and while they might not completely eliminate the challenge ahead, it could ease the moving process. The following are some tips that staff at our moving company have to offer. Most children love forts. Ask your moving company for a couple of extra boxes and take a 10 or 15 minutes to help your children build a fun fort to play in. This can be especially useful on moving day when all of your items are being put into boxes. If you have many months to prepare for your move, or even weeks, be sure to sit with your children and prepare them for what lies ahead. Talk to them about their new home, show them pictures, and describe their new school. You might even show them pictures of activities to do, or if it’s not too far, take them there and show them for yourself. If possible, before moving day, try to take your children to their new neighborhood. Go for walking tour of the area and visit a nearby park or recreation area. This eases up any surprises by helping the children to know exactly what they can expect. For more information on moving with kids, or to ease your move with children, contact the moving company in Buck County, PA at Suburban Solutions today. You do not have to pack up, fill the moving truck, and transport belongings all on your own. You can hire a moving company Bucks County, PA to do this instead, so you can avoid the wear and tear your body may endure. While a moving company Bucks County, PA does cost money, there are perks to having professionals do it for you. These workers can offer strategy, team strength, and the right equipment needed to get even the heaviest items out of your home. Especially when it comes to appliances, the average person does not have the tools needed to get it out to the truck safely. Many people underestimate a really good stretch. Take the time to stretch before you get into the flow of packing and moving items out. If you feel tension in an area of your body as you are carrying something, quickly put it down. Keep in mind that even if you don’t feel aches during the process, if you aren’t using proper body mechanics you may experience pain later on. Stretching helps elongate and loosen up our muscles, enabling us to be more flexible as we are moving to and from. Heat exhaustion, dehydration and hunger are other things to consider on the moving day. In the midst of all the hustle and bustle, we may forget about food and water for many hours. Keep a small station of non-perishable snacks and water to keep you and anyone assisting with the move hydrated and nourished. If you feel weak, stop and see what your body needs before continuing. If we listen to the signs our body is giving us when something is too heavy or we are parched, it can decrease the chances of an injury. If you do not have a first aid kit at home already, you may want to purchase one for the moving day. Yourself or those who may be helping you, could get minor scrapes and cuts. Depending on the severity of the injury, a first aid kit may treat it just fine or more urgent medical care is required. Remember that not all injuries are external. If you get dizzy or nauseous, it may be time to take a break to prevent from passing out or injuring yourself because you feel weak. Would You Like a Free Estimate for Your Move? To learn more about our comprehensive moving services, or to discuss further questions, please call us today. If you’re planning on moving, one of the most important things you can do is look for a moving company Bucks County families trust. At Suburban Solutions, we aim to make your move as simple and stress-free as possible. Individuals and families often have different needs when they’re moving homes, and for this reason, we offer several types of moving services. Even if you’re just moving a few minutes across town, there’s no reason why you have to do it all by yourself. Our local moving services are fast and dependable, and we can customize our crew sizes to meet your needs. Whether you need a couple of helping hands or a whole team of crew members, Suburban Solutions is a top moving company Bucks County residents depend on. For local moving services, our local pricing is based on a truck fee and on labor costs. If you’re planning on a bigger change of scenery, hiring a Long Island moving company can definitely be an advantage. Moving across state lines can be very complicated, but our moving services help make the process just a little bit simpler. Our crews undergo multi-day training sessions so they are prepared to transport and protect your personal belongings during the trip. No matter where you’re moving, our team is capable of getting your items there safely and quickly. As an experienced moving company Bucks County can provide, Suburban Solutions understands that moving within a big city involves its own unique challenges. We also know that if you’re moving a small apartment, there’s no reason you should have to pay the same rates as someone who is moving out of a five bedroom house. Our express moving service in Bucks County and Washington DC gives you lightning-fast service and quality customer care. Many people want the convenience of transporting their own boxes, but feel overwhelmed at the thought of packing all those boxes. Our labor-only services give you more flexibility while still helping you with the most time-consuming part of moving. You won’t have to pay for any truck fees, and if you choose to rent your own truck, we’ll even load your boxes for you. Some might say that this labor-only service takes business away from us, but we believe that giving options to our customers only strengthens our reputation as a dependable moving company in Bucks County. If your business is moving locations, you’ll definitely want to have a trusted moving service on your side! Our crews are just as capable of moving an entire office as they are moving residential items. When local businesses need help relocating, we can assist in every step along the way. There is certainly more than one reputable moving company in Bucks County, but there are also many companies who try to take advantage of consumers who may be particularly vulnerable to these scams because they are distracted and overwhelmed with all the details of the move. Although you may be tempted to hire a moving company because their price seems much lower than other estimates you have received, that is often a strong indicator that the moving company may not be legitimate. The following are some signs that should serve as red flags that the company may be trying to pull a scam. If the deal a Bucks County moving company is offering you sounds too good to be true, the chances are that it is not legitimate. Companies who pull underhanded tactics with consumers will often have an advertised price that doesn’t include many of the things that the consumer may assume are included. For example, the consumer may not be aware that the advertised price does not include moving where there are stairs. This will cost extra, often a substantial amount. Except the consumer does not know this until the moving company has already begun the move, leaving the consumer to feel like they are being held hostage because the move has already begun. What Should I Look for When Researching Moving Companies? There are plenty of websites that offer consumers a place to add reviews of companies they have hired, including Yelp!, Angie’s List, Google+, and Facebook. Search these sites to see what people who have hired a moving company you are considering. However, also be on the lookout for reviews that are all perfect. These could also be indicators that they are false reviews place there by the company and not real consumers. Is Requesting a Deposit Normal Moving Company Practice? It is a normal business practice for a moving company to require a deposit for your move, typically a percentage of the total estimate they have provided you. If the moving company requests a very large deposit or require full payment for the move up front, those are definite red flags that they will likely not show up on your scheduled move date. How Can Consumers Avoid Being Scammed? First of all, make sure you leave yourself plenty of time to book your move. This way, you will not feel pressured to take the first company available because the date is already booked with other companies you have contacted. This also allows you enough time to build a relationship with the company and make sure they actually do follow through with what they say, such as doing an onsite visit to determine what the cost of the move will be and other details. Factors such as whether they show up for that appointment, were they on time, and how long did it take for them to provide a written estimate will be strong indicators of how good the company is at follow through. It can be an exciting time to relocate, as things are changing and new opportunities may unfold. During this process however, it is crucial that you take care of yourself along the way by hiring a moving company Bucks County residents rely on. Injuries while picking up a box that is too heavy or pushing a virtually immoveable furniture item by yourself can result in a quick trip to the emergency room. Moving can be strenuous exercise, and not everyone has the physical means to do this solo. To ward off the chances of such an injury, you may consider hiring a professional moving company to do the packing and hauling for you. Q: What is the most common injury during a move? A: Back injuries are some of the most prevalent types of moving injuries. When picking up and carrying boxes, it is key that you protect your back by doing stretches and even wearing a back brace if needed. As a rule of thumb, always lift with your leg muscles and not your back. Even minor injuries like muscle soreness, sprains and strains can arise if improper posture is being used when carrying bulky items. Q: At which stage of the moving process do most injuries occur? A: Moving an item here or there as you are boxing up belongings may not be enough strain to cause an injury. When people are still in the packing stage, they aren’t usually rushing around too quickly unless they have waited until the very last minute. Injuries such as back strain, broken bones, and dehydration are more likely to happen on the moving day itself. Once things get going, the pace can speed up due to wanting to get things loaded as fast as possible. But, this means you may forget to take rest breaks, eat, hydrate, stretch and lift using proper techniques. Q: What are some general moving tips? Stay hydrated by buying a case (or two or three) of water for moving day. Avoid wearing clothing that is too loose or too tight, as you may get twisted or restricted while moving items. Schedule the moving day and time for when you are most alert, whether that be early morning or mid-day (it may not be a good idea to load during night hours). For rainy weather, keep towels at the entry doorway and a mop handy for easy clean up if water gets tracked in through shoes. Get plenty of sleep the night before and leading up to moving day. Keep a first aid kit handy in case of a minor scratch or injury. When you’re getting ready to move, don’t forget to look for a dependable and local moving company that can make the process easier. At Suburban Solutions, we’re proud to offer such an essential service to Bucks County families and businesses. For more information or to request a quote from a top moving company Bucks County residents can trust, call us today.